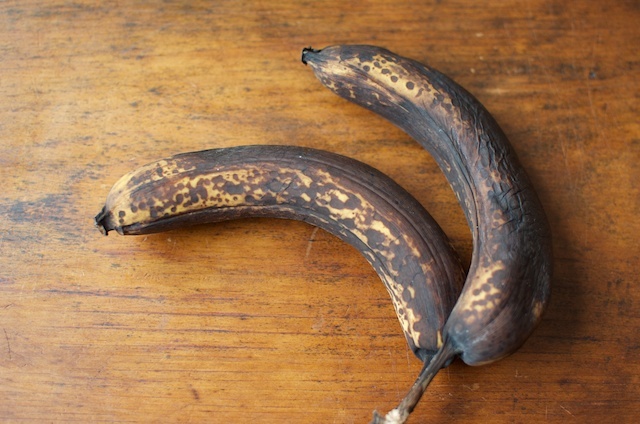 We all have our ways of dealing with overripe bananas. Some make quick breads. Others freeze them for smoothies. Still others make up giant batches of waffles for quick breakfasts. I used reside firmly in the banana bread camp, but as I work to reduce the amount of sugar and refined grains I eat, a tempting loaf of quick bread just doesn’t seem like the smartest choice. Still, as I stood in the kitchen earlier today staring down a pair of very black bananas, I knew I needed to do something with them quickly or surrender them to the garbage. Banana bread was tempting, but a batch of granola just seemed more sensible. Peanut butter banana granola. I melted 1/4 cup of peanut butter with 1/2 cup of honey. 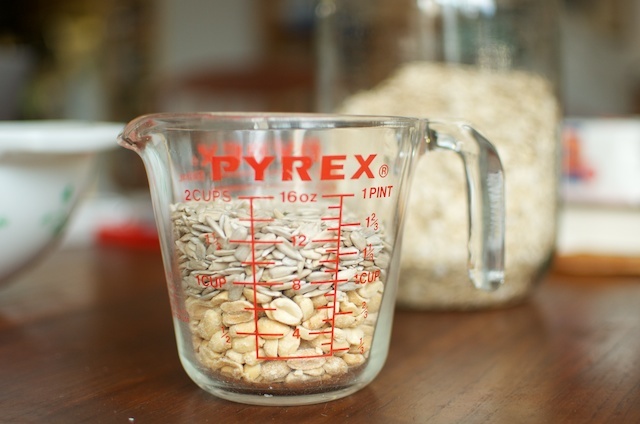 Once it reached a boil, I whisked in two mashed bananas and 1/2 teaspoon cinnamon and then poured it over 4 cups of oats, 1 cup of salted peanuts, and 1/2 cup sunflower seeds. 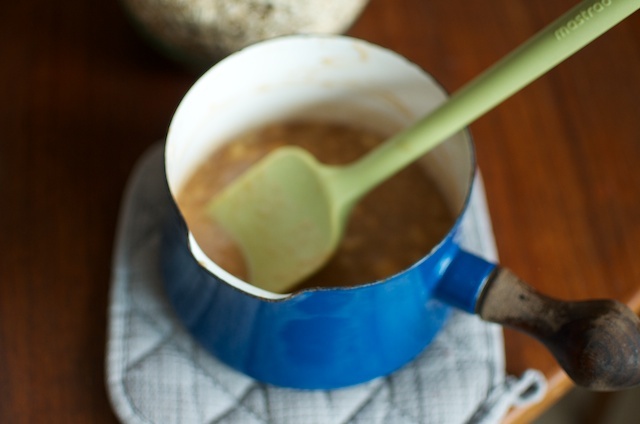 I stirred until the oats were entirely coated with the hot honey, peanut butter, and banana slurry. Once the ingredients were all incorporated, I spread it out on a rimmed cookie sheet and popped it in the oven at 350 degrees F for about half an hour. 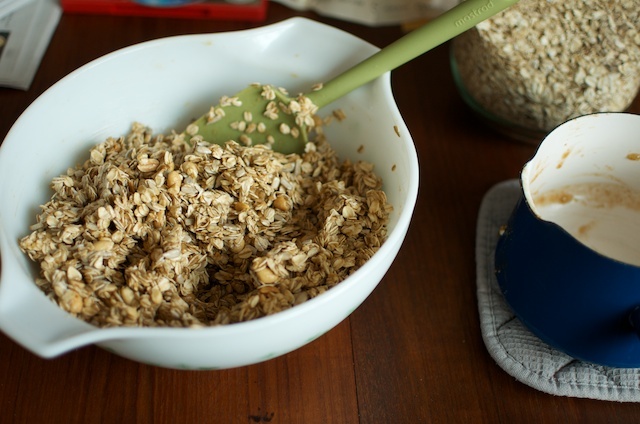 Granola is a tricky beast and needs regular stirring, so don’t stray far. If you prefer, you can also cook it at a lower temperature for longer, but I had an errand to run and so needed it to be done quickly. Once it was done baking, I scraped the granola into a mound in the center of the baking dish and pressed with the back of a spatula to help encourage crunchy clusters. I am quite happy with the way this granola turned out. While it’s neither aggressively banana-y or peanutty, it’s got good flavor and is satisfyingly crunchy. I didn’t add any dried fruit, but will probably add a little palmful of raisins when I eat it to up the sweetness a little. If you make yourself a batch, take care to let the granola cool completely before funneling it into a storage jar (my batch filled a half gallon exactly). I think I rushed it a little and I’ve found a few softer clusters. It’s certainly not going to stop me from eating it, but I wish I’d been more patient. 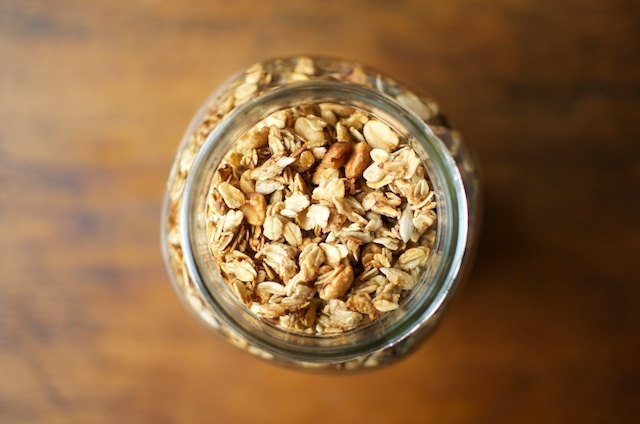 Have you eaten this granola like cold cereal with milk or hot cereal? It sounds really good. I haven’t had a bowl like that yet, but that is one of the ways I often eat granola and plan to do the same with this one. I love peanutbutter and banana sabdwhiches with honey on wheat bread… so I’ll definitely give this a try! Especially since I already have more frozen bananas & banana bread than I know what to do with, oh dear. Know that frozen bananas lose some of their sweetness, so you may need to up the honey just a little bit if you’re using frozen and defrosted bananas. Oh, yum Marisa! Such a great idea. How long will this keep in jars? Probably about a week to 10 days. For longer storage, stash it in the freezer. All this to say, I would think a longer shelf life would be fine. Do you think it’ll keep at room temperature? I’ve been meaning to try banana granola! It’ll keep for about a week at room temperature. For longer storage, I recommend stashing it in the freezer. Oh, that looks very nice. I probably would not have thought to make granola 🙂 I have some overripe bananas in the freezer right now. I found a recipe for chocolate banana bread. Mix thoroughly and let sit for at least five minutes. Drop spoonfuls on a cookie sheet and press flat with your fingers. Bake for 25-30 minutes at 350. These are great when you need to grab something on your way out of the house. I added raisins for a bit, but my daughter had trouble digesting those. 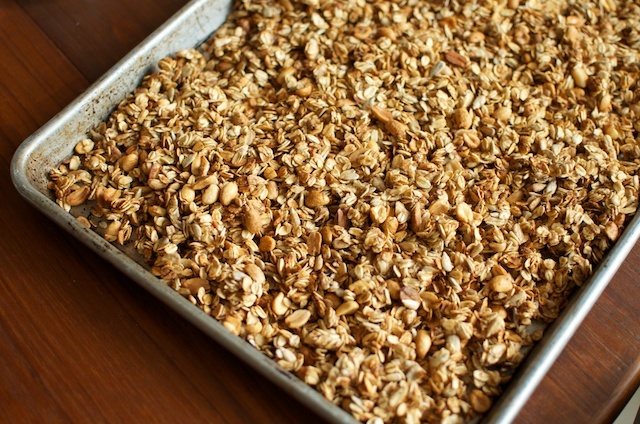 Love a good homemade granola recipe! This would make a great homemade gift for a friend or hostess too. Can it be made into bars? My husband eats loads of store bought bars. I’ve been looking for a recipe to make a healthier bar but they all call for at least a 1/4 to a 1/2 cup of oil. Thanks. You’d need to add a lot more peanut butter and honey to form it into bars. It does not have that kind of clumping power in it’s current form. OH I am so making this today! I have two bananas languishing in the fridge as they were attracting far to many unwanted guests (i.e. fruit flies!) and a jar of crunchy peanut butter which I just discovered my kids don’t care for. Really?! Yep, teen boys who like creamy peanut butter but not crunchy… go figure! I have given up on trying to figure out the teenage male mind. ha ha! I made this tonight. I couldn’t find shelled sunflower seeds at my local grocery, so I used some pepitas I had on hand. It’s pretty delicious, so thanks for the recipe! Can you share with us how you are working on reducing sugar in your jam making? That would be so helpful. Thanks. Thanks, Marisa. I’m a teacher and the last month has been crazy so I am behind on my blog reading. I look forward to looking through those posts this weekend! Any thoughts on swapping out the honey with maple? We live in Vermont, and make our own maple syrup… would love to incorporate it, if it would be good. If so, what is the replacement ratio? Thanks so much! Plan to make this in the morning. Made this this week. It is delicious. I didn’t do a very good job as stirring frequently so it wasn’t evenly browned 🙁 I did get some lovely clumps which was a nice surprise (I’ve yet to master the art of making clumply granola). Do the clumps get broken up by stirring too much while in the oven? Can I omit the cinnamon as someone in the house has an allergy to it. If I do omit it, will it still be ok? Yep, feel free to omit the cinnamon! Thank you so much for sharing this recipe! I have a tree nut allergy, and it’s hard to find recipes that don’t have tree nuts but still have a lot of substance and flavor if you leave them out. This one sounds delicious! And, I think I have everything but the oats and peanuts. As I was reading the recipe, I was wondering if I could make a pumpkin version… substitute salted pumpkin seeds (out of the shell) for the peanuts and canned pumpkin (not the one-pie stuff) for the banana. Maybe when I pick up the oats and peanuts, I’ll grab a can of pumpkin and give it a try once the peanut butter/banana version is gone. I think a pumpkin version sounds delicious. I picked up the peanuts, pumpkin and oats yesterday afternoon. Once I empty the sink of dishes, I’m going to make the banana version, since the ripe bananas are ready to go. Then, next week (since I’ll be eating granola with everything! ), I can make a batch of the pumpkin version. In my mind, 1 can of pumpkin is about the same as the 2 mashed banans, so I should be good to go! One can of pumpkin puree is approximately two cups. Two smashed bananas is more like 3/4 to 1 cup. Been meaning to make granola for years – especially since I buy the expensive stuff to have for breakfast every day. This recipe got me going! I substituted maple syrup (equal amount) which I had on hand for honey and added small amounts of pumpkin seeds and crushed walnuts for a bit more “umph” . LOVE IT! And now my husband’s eating it (maybe I’ll have to make a double batch next time). Thanks for getting me into homemade,healthy granola! great recipe! at what point would you add the raisins? You would stir them in after the granola has finished baking, but before it had cooled completely. This looks so delicious! Can I sub butter or canola oil for the coconut oil? Yes! It needed this in my life.